Orange County film fans of all ages (but mostly adult!) 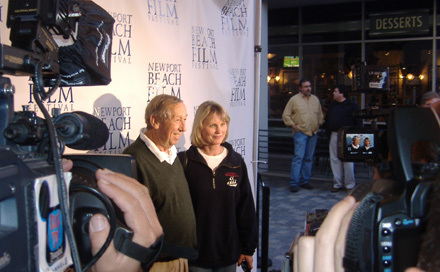 turned out in droves on the evening of April 30th to catch one of 2008’s Newport Beach Film Festival’s key events: Roy Disney Presents. Roy E. Disney, nephew of Walt Disney, showed up with longtime Disney producer Don Hahn to present an evening of rare Disney shorts. Also on hand was Disney jack-of-all-trades Dave Bossert to help out in introducing and giving background to each film. The evening began with a screening of a Disney.com tribute to recently passed Nine Old Man and Disney Legend Ollie Johnston. 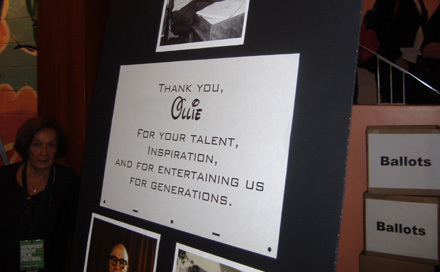 Roy noted that many people who worked under Walt contributed enough to the Disney legacy to qualify for the label of one of the Nine Old Men but that Ollie Johnston most definitely qualified for it. Some of Ollie’s art was also on display in the theater lobby. Then the first short screened was Goofy’s new short How To Hook Up Your Home Theater. In a city where the poorest folk have to settle for only 60-inch home theater screens this short, which shows Goofy going batty in an attempt to upgrade his television system, received an empathetic response and loud audience approval. Next up was One by One, the short included on the Simba’s Pride DVD re-release and one of the segments created for the proposed but never completed Fantasia 2006. It was noted by Roy that this would’ve been the first piece in said film and that the music for it was recorded in South Africa. It was noted by Don Hahn that this was quite possibly the only big screen presentation of One by One ever. 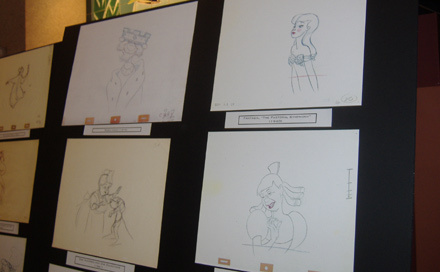 The third short shown was Oilspot and Lipstick, a junkyard fantasy and early attempt at CGI animation which was an after-hours project and could be seen as an early Pixar piece. One couldn’t help but think of Wall•E while watching Oilspot and Lipstick. Short number four was the Salvador Dali/Walt Disney collaboration Destino (the second Fantasia 2006 short of the evening). Roy gave a lengthy history of this short, explaining its genesis in 1945 and how its completion in 2002 came about largely because of a legal issue forcing it into being. Roy also explained John Hench’s involvement in the short and mentioned John as another Disney artist who could easily have qualified for the Nine Old Men label. Then it was Roger Allers’ The Little Matchgirl (another Fantasia 2006 piece), based on the Hans Christian Andersen short story of the same name. This short was almost never completed due to Michael Eisner insisting that all Disney stories have a happy ending. As an exception to the rule, The Little Matchgirl definitely leaves you with a lump in your throat. Redux Riding Hood, produced by Walt Disney Television Animation, is a dark, frenetic look back at the popular bedtime story, with shades of Ren & Stimpy, and a star-studded voice cast comprised of Fabio, June Foray, Garrison Keillor, and pre-controversy Michael Richards. Turning the darkness up a notch, the audience was then treated to Lorenzo (the fourth and final intended Fantasia 2006 piece), the tale of a pampered blue feline who has a demonic hex put on his tail. The story for it was based on an idea by Joe Grant, who was also mentioned by Roy as another Disney artist who could easily have qualified as one of the Nine Old Men. As Lorenzo finished I realized I had just watched what may have been the closest thing ever to a theatrical presentation of Fantasia 2006. Finally, turning the darkness up to eleven, the evening ended with Runaway Brain, the 1995 short that features an evil Mickey and even a visual allusion to William Friedkin’s The Exorcist. Dave Bossert mentioned that the eagle-eyed viewer can find in this short a pink slip with the initials “JK” on it, a reference to Jeffrey Katzenberg’s then recent departure from The Walt Disney Company. On a lighter note, Bossert also pointed out the short’s character of Dr. Frankenollie, a purposeful tribute to Disney animators Frank Thomas and Ollie Johnston, thus bringing the evening full circle by again referencing Ollie. 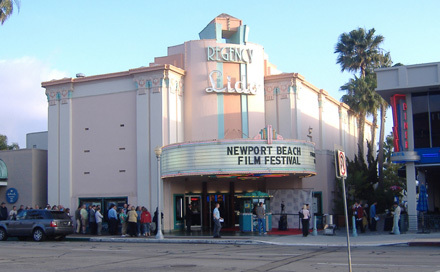 To close out the evening Roy said he had access to enough rare shorts to bring a new program to the Newport Beach Film Festival every year for the next ten years, which offhanded remark was greeted with thunderous and enthusiastic applause. Let’s hope it happens. With the very adult and elite crowd that was in attendance enjoying every minute of the show (there was even a loud collective groan when Don Hahn signaled that the last short of the evening was about to begin) it was proved that animation is not just for children and simpletons but for every member of the human race. 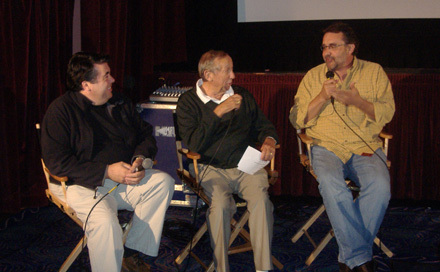 Roy Disney, Don Hahn and Dave Bossert arrive for the Roy Disney Presents event at the 2008 Newport Beach Film Festival, flanked by cameras and an interviewer hungry for sound bites! Andreas Deja and Mark Henn on the Return of The Goof!